Last Sunday saw the return of the New Forest marathon. After a hiatus last year, the event is now run by different people who in the past year have reinvented the New Forest marathon that has been going since the 1980s. I last ran the New Forest marathon back in 2011 and the current main photo on this blog is from the long, hard hill at the 23 mile mark at that event. The course is totally different now and was tougher, I’ll explain more about that shortly. Having picked up my race number on the Saturday, I arrived at the New Park show ground in Brockenhurst in plenty of time with no pressure on me at all on race day morning. I got parked easily, had a stroll around the race village and got my final toilet preparations completed. I then met up with my brother and friends from his running club and we had some essential pre-race banter. It was cool with some sunshine and the rain held off. There was some wind on some of the more exposed parts of the course, but nothing like the strong sea winds I am used to training in, so the weather was great for the day. Once I’d put my bag in, I started getting focused on the race and when the warm-up started happening in the central part of the race village, it was time to get ready. Once warm-up had finished, the runners were called to go and find the way to the start. Not many people at all put their hands up to go in the first wave of runners and I ended up virtually on the start line despite my best efforts to pull back into the crowd. While waiting, we were then subjected to a race compere of sorts. For some bizarre reason he had dug out an old Guinness book of world records annual and was regaling all the runners with random world records and some cringe-worthy gags. Well done to the ever happy and wonderful Liz Yelling for keeping a smile on her face as she sounded the start horn and we were off. One of the things that I had probably not really expected or prepared diligently for, was the fact that so much of the course was gravel and pebble strewn pathways. The course was not one where you could wear trail shoes as there was plenty of road to run on too, but my lightweight race day shoes meant that I could feel just about every stone I trod on in fine detail. For most of the marathon course, you could choose to run on the areas with less loose stones on, but when the course merged with the half marathon runners, there was no avoiding the bigger, loose stones if I wanted to get past anyone, so the balls of my feet felt that they were on fire by the end of the race. My only other whinge was that the mile markers from mile 12 through to 19 were well, well off. They simply cannot have been measured. When I ran past the mile marker for mile 19, I was closer to 17 miles. Mile markers tend to uplift me usually, but the ones at this race were just frustrating. I did not know if I had issues with my watch, and if I should speed up or slow down as a result. A couple of runners I chatted with suggested that the tree cover might have effected our watch’s satellite signal, but by the end of the race, I was bang on 26.2 miles, so I don’t think I had an issue with my watch and if so, it would only have been a tad out. Those things aside, the event was marshalled by smiley, happy people all giving up their time on a Sunday. The water stations in particular were filled with enthusiastic people who had lots of encouragement to give. For me, this was supposed to be a training run prior to a bigger longer distance event I have in a few weeks time, so I was not intending on really busting it. However, for the first 3 miles, I was running in the top ten runners and was comfortable with the pace being run. As I eased up a bit, and they pressed on, things dispersed and that meant I ran virtually alone from mile 5 through to 18 or so. I was passed by a couple of guys at mile 20 as I was puffing and blowing a bit from the hills. The earlier hilly section of the course from roughly 7.5 miles through to the 15 mile mark had taken a bit out of me though I tried to hold back from sprinting up them and save myself. From mile 20, there were a few more downhill sections and I got passed by the guy who was the eventual winner (on Chip time) who seemed very fast and spritely I must say. At that point, I felt like I was going to slip down the field a bit as it was not a day or a course for running a PB, and I was not going to really push myself any harder and I felt a bit of a lull. With a few miles to go, the marathon course merged with the half marathon course and I was running among a very busy pathway filled with runners. This actually gave me a boost as I felt like I was running much faster than I had done while running alone earlier. I perked up, shared some banter with some of the runners and got my head down for the final push. The course came in to the park and did a circuit of it before arriving at the finish line, during that lap I managed to overtake a couple of marathon runners, and counting the number of people who had passed me since the start line, I guessed that I had come 14th overall. I crossed the finish line with some lovely family and friends waving me on which was marvellous. The course did give some great views of the New Forest landscape which I enjoyed, and there were plenty of horses and ponies on parade around the course. Many locals were cheering from their gardens and were very kind and supportive; I even had a mini chat with a couple about how far on I was! The medal is very handsome. I like it a lot. I finished in 3hrs 11mins and 20 seconds, which I am pleased with as this was supposed to be a training run and was a tough course – well, I found it tough. I waited at the end for my brother to come in, he had a good day and finished the race in a far faster time that he had planned and that made for a great day. Here are my race stats from my watch for those interested…. I had to attend a family 40th Birthday party that afternoon, so headed home to shower before cake and beer at the party. There was music and shenanigans due in the park after the race. I think I might have been persuaded to stay if there was a beer tent. If they organise one for next year, I might consider running this event again. The baggage reclaim guys were awesome and I was changed and in my car heading back home in no time. There were some small queues getting out, but the staff helping organise the cars getting in and out of the car park were brilliant. This made me happy. Not like trying to get out of the Great South run car park which is soul destroying and painfully slow. It was a good day. I got to the family party and they had an inflatable slide in the garden, I got cajoled to climb up and have a go with my youngest and as a result got friction burns on my elbows (been a few years since I had some of those!) which actually hurt more the next morning than my aching legs! 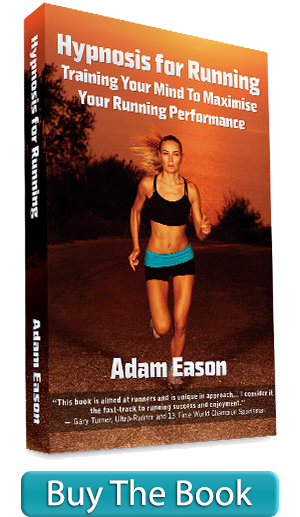 This will be my final blog entry on the Hypnosis for Running blog while it is in this format. We are just about to give this small hobby site of mine a complete facelift and we’ll have a lot more going on here in coming weeks – do look out for it, there’ll be a LOT of free resources for runners. Great to read this, Adam. Delighted you enjoyed the race & recorded such a great time! No doubt you’ll be pleased to know that, following our Summer coaching session on the beach, your advice of “Hips to nips (and repeat…! )” is now my ear-worm mantra when I find the going tough and my form is failing mid-run. Keep up the good work, mate! Thanks Nick, I am pleased I have made an impression.